All it took was one. Agent The BigLabowski happened to be a new member of Fistful's own corporation. What luck! As we saw in yesterday's MinerBumping post, a respectful "gf" in local is the first step toward recovery. John Supplier huddled up with his blingy Hulk in a 0.9 security system, quietly chewing on the rocks. He didn't get away with his crimes for long; Agents Comedian II and samloopy were on the case. 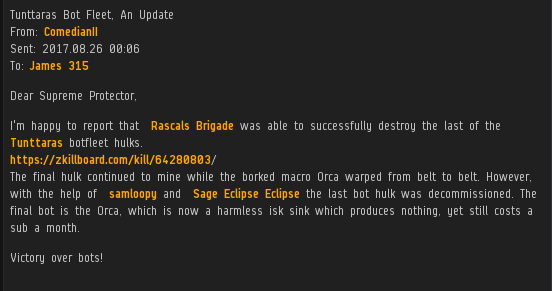 Rascals Brigade corporation was investigating a rumored bot fleet operating out of 0.9 that contained multiple blingy Hulks. Our heroes grabbed a bunch of Tornadoes and blapped the bots one after another. 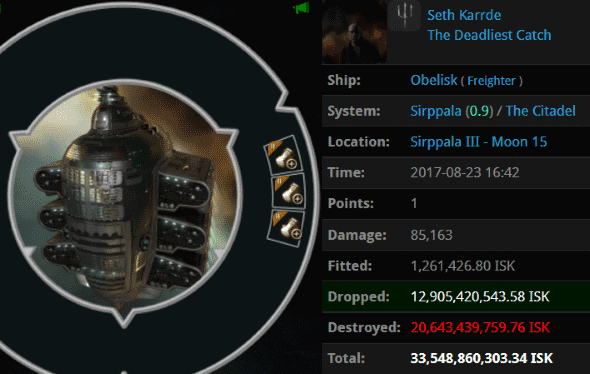 In all, over 5 billion isk worth of botting equipment was destroyed. The Agents' suspicions about illegal botting were confirmed by the behavior of the surviving Orca. The New Order remains EVE's best protection against bots. From bots to bling: An even more expensive Hulk was piloted by Avatarian Artificer. He was caught in the act by Agents Crom Cimmeria and Subotai Hyrkanian. Amusingly, Avatarian tried to tank his Hulk with a blingy ORE bulkhead module. Talk about missing the point! 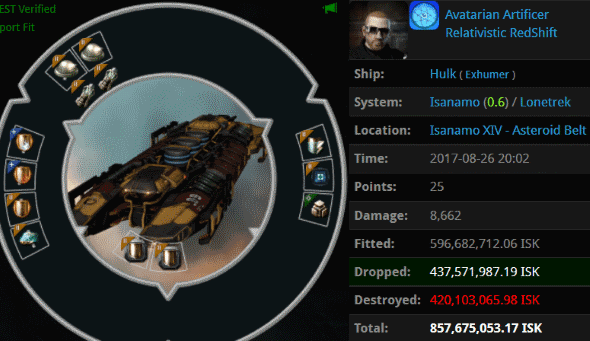 The criminal also had a quarter billion isk worth of blingy mining drones. What a Goofus. 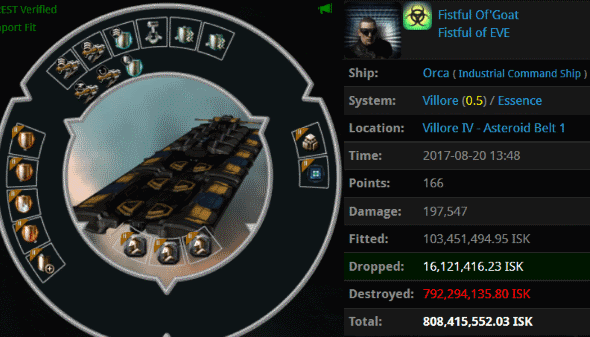 fvt Maier found a different use for his ORE modules: Pointlessly lowering his ship's hitpoints. After equipping (de-equipping?) his freighter, the carebear headed straight for Uedama and death. Agents Sherri Rozei, Trump The King, Ruby Rozei, Tawny Rozei, Christine Rozei, Giselle Rozei, Shanade Rozei, Lagatha Rozei, Baron Rozei, Ivanka Rozei, and Katy Rozei of the mighty CODE. alliance were waiting for him. That explains the blingy cargo expanders: He needed plenty of extra space for his cargo, which consisted of a single shuttle. A guy like Seth Karrde would laugh at someone anti-tanking their freighter to carry a shuttle. He had his own faults, though. He anti-tanked his Obelisk and filled it with everything he owned in the game. 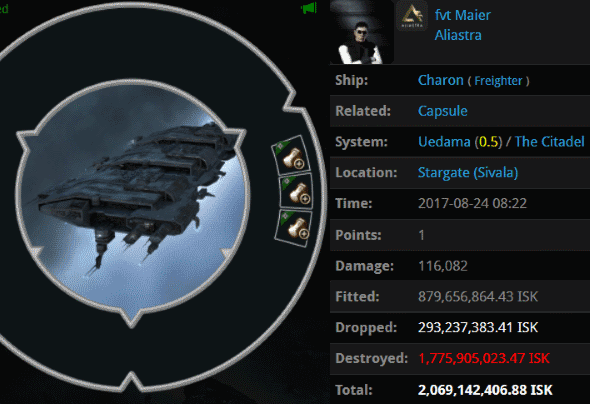 The stuffed freighter became a 33 billion isk monster. 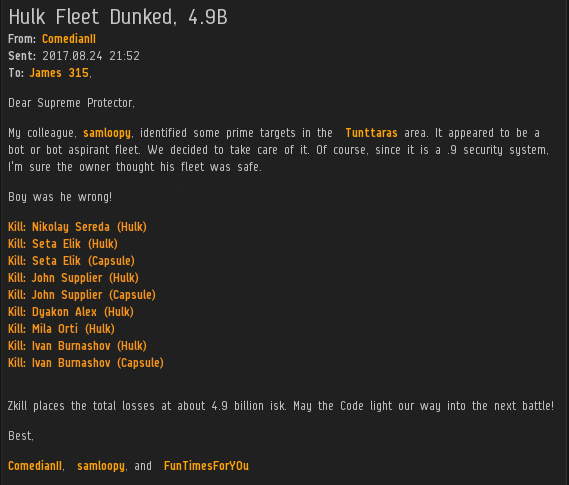 But it was no match for the massive gank fleet that came to meet him. Agents dAbOsSlAdY77, SynthiaGreey, Jet Set Milly, Tantaria Stavanghar, Tarwinz, Gea Stormbound, Collateralized Contracts, Skiff Poddington, Hulk Poddington, ZAKURELL0 LINDA, Perlo Tissant, Mack Poddington, Wylde Ranger, Darnoth, Spartan Girl, ClearLove, Ivana Freemam, James Poddington, InferiDiii, Mr Ichinumi, Esibel, Douglas Alavanille, Sadepilveni, Ruby Dubes, Padme Love, Open Your Heart, Lucifer Jaynara, Bluekiss, Lunar Love, grr gons hatgons, Selina Love, Tarwin JR, Urban Worrier, and Lawrence Lawton braved the rapid CONCORD response times of the 0.9 security system to get the job done. FaceEater101, too, would've been amused by the idea of a freighter carrying a shuttle. To move a shuttle, why not simply pilot the shuttle itself? Not so fast. Our Agents are constantly on patrol for autopiloting shuttles. Agent Lisa Tancos detected the bot-aspirant and moved in for the kill. 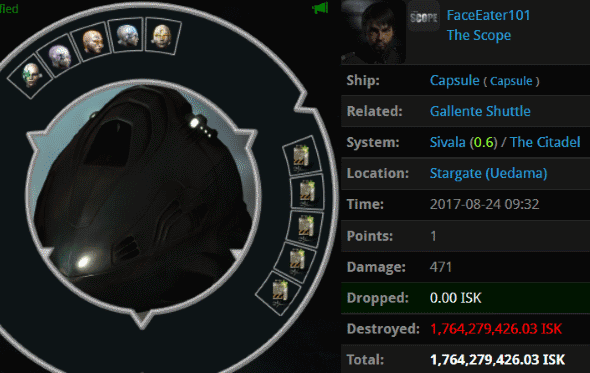 Upon removing the shuttle, our Agent sunk her teeth into a juicy pod with 1.7 billion isk worth of implants. Intriguingly, the carebear's implants were focused on improving his gunnery skills. A future mutterer of the "ships that can't shoot back" meme, no doubt. Unbelievable...I fly past you idiots all day long without a second thought, whether I'm mining or hauling. Guess you turds really are only good at ganking AFKers as I've heard. Post proof, or it's just more impotent lies little carebear. HAHAHAHAHA Proof your elite or just go back to your baby games with miners. HAHAHAHA code still thinks it being pvp cute. The Tunttaras operation is botting. 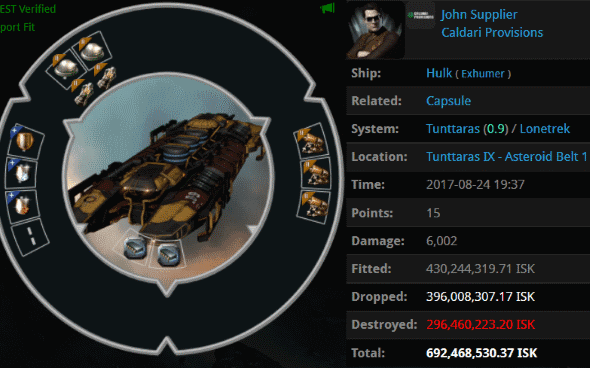 Reported to CCP a year ago and still running. 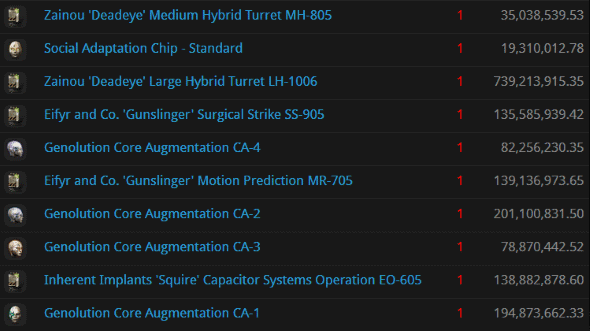 There's another big botting operation in Hageken that CCP doesn't care about. Our work is more necessary than ever. The Inglourious Bastards should join forces with Code to help hunt down the botters. I'm pretty sure both sides can agree on that. Wow Eugene fischer everybody, what Nazi schemes has he concocted today. Nothing original, oh yeah he became a bot. Looking forward to the tears! Loyalanon has become a bot, he needs to die. Miners unite! Report any Code bot operations to CCP!